Another day, another doubles point surrendered to a high-profile opponent. Another weekend, another stretch of less-than-ideal weather conditions. Last but not least, another match, another display of resilience from the Cal women’s tennis team. Fighting through early deficits and match delays, the Bears (10-6) battled to the tune of two crucial match wins for the final time this regular season at the Hellman Tennis Complex. 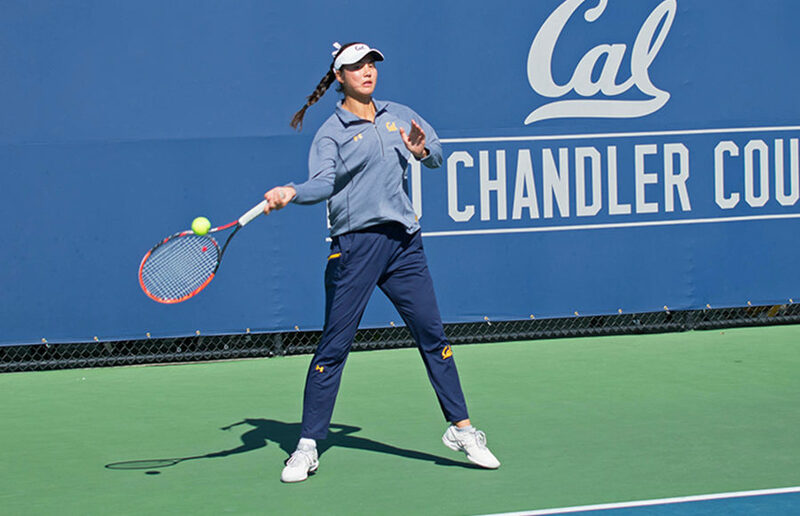 After knocking off upset-minded Sacramento State (7-11) headed by senior Ana Loaiza Esquivias, Cal rallied past Oregon (12-7) — a formidable opponent known for its supreme, and occasionally unbeatable, doubles play. While Saturday’s 5-2 triumph against Ducks was far from a walk in the park, Thursday’s 7-0 sweep over the Hornets was as close to a cake walk as the Bears have handled all season long. That’s not to say Sacramento State didn’t pose as a potential threat coming into the cloudy showdown, which was pushed up an hour because of a rainy forecast later in the afternoon. Cal came into its final homestand having lost its previous match 4-0 against Arizona State, and it currently holds the No. 49 ranking after opening the season just outside the top 10. Meanwhile, the Hornets buzzed into Berkeley as winners in four of their past five dual matches, placing the pressure on the home team. With the No. 26 Ducks looming in the rearview mirror, the Bears came out with vengeance, silencing the Hornets while failing to drop a single set throughout the afternoon. The No. 48-pairing of Cal junior Olivia Hauger and freshman Julia Rosenqvist kicked things off by securing the doubles point against redshirt freshman Maria Gonzalez and redshirt sophomore Carolina Chernyetsky. It was a much-needed break for a squad of Bears that has struggled in doubles without senior Karla Popovic in its lineup for much of this year, but Rosenqvist has emerged as a viable replacement down the stretch. Maintaining a sense of urgency after the transition from doubles to singles, Cal’s singles play was as solid as it’s been in recent memory. Of note, freshman Vivian Glozman’s 6-0, 6-0 win over junior Sofi Wicker was just the latest chapter of Glozman’s rise to prominence over the past several weeks. Freshman Anna Bright sealed the deal with a 6-2, 6-2 beatdown of Loaiza Esquivias, flexing her No. 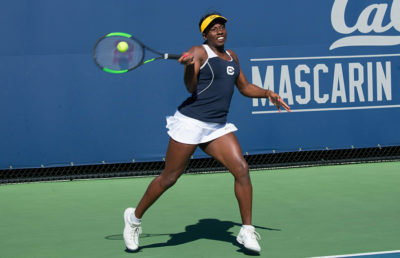 32 singles ranking in style with another match clincher to her name. It wouldn’t be the last time she would impress over the two-day stretch. With a comfortable downpour settling in Friday afternoon, the battle of Pac-12 schools was pushed to Saturday in what looked like another difficult loss for Cal in a season full of tough finishes. While Rosenqvist and Hauger held their own against the No. 69 duo of sophomore Julia Eshet and junior Shweta Sangwan, the Ducks didn’t blink after the initial setback. After senior Alyssa Tobita and sophomore Rifanty Kahfiani led the charge in snatching the doubles point, Tobita and her No. 95 singles ranking shocked Rosenqvist and her No. 41 label on court one, extending Oregon’s lead to 2-0. The Bears could have folded after that, but they instead decided to casually rattle off five straight singles wins. In the blink of an eye, the Ducks’ advantage vanished. With Hauger and Bright persevering against their unranked opponents, it was Glozman and junior Maria Smith who dropped the axle, overpowering freshman Paiton Wagner and junior Daniela Nasser, respectively. Glozman’s late rally after dropping the first set seemingly ignited Smith just a single court over, as the pair of matches concluded just minutes after each other. Freshman Hana Mraz tacked on a dramatic singles win of her own on court six, sealing arguably Cal’s biggest match win of the year. While the Bears will undoubtedly have their eyes set on conference championships later this month, they still have three Pac-12 dual matches to finish out the regular season, including a date on the farm with Stanford on April 20.